Vietnam visa on arrival may be the most popular keyword you can see as you are learning how to travel Vietnam today. In order to apply for a visa on arrival and get the approval letter from the Vietnam Immigration Department, you’ll need to complete several simple steps below. In this article you are provided with the instructions on how to apply for a visa on arrival as well as the description of how visa on arrival works. Enter the exact personal information of the applicants that matches the information on the passport including: full name, gender, date of birth, nationality, passport number. Decide the most suitable visa type that you need including the visa validity (1 month/ 3 months/ 6 months); number of entries and exit (single entry/ multiple entry); purposes of visit (tourist visa/ business visa) and select the date of entry. In this stage, the date of entry may not be the exact date you will arrive in Vietnam later but it should be as closed to the actual date of entry as possible. And it must NOT be BEHIND the actual date of entry (BEFORE the actual date of entry is accepted). The form is provided at http://www.visumvietnamonline.com/apply-online/. Double check your passport to make sure entered information is correct and pay for the service fee. Payment can be made with credit cards, PayPal, Western Union or bank wire transfer. Read more about Vietnam visa fee. – If you skip the payment step, your visa processing will be delayed until your full payment is completed. Once the payment completed, you will receive a confirmation from us via email. – The payment via Western Union must be verified by providing the copy of payment receipt. Please enter the information of the recipient correctly to avoid any misleading. The visa approval letter will be delivered to your registered email as the ordered processing time (1 hour, 4 hours or maximum 2 working days for tourist visa/ 7 working days for 6 months or 1 year business visa) with detailed instructions on how to get visa stamp upon arrival airports in Vietnam. Present the passport, visa approval letter, photo, the completed application form for entry and exit Vietnam (NA1) along with stamping fee to the Immigration Officers to get your visa stamped at the arrival airport in Vietnam. 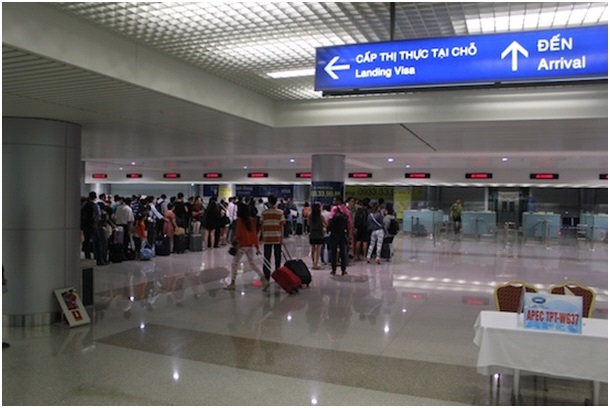 Aiming to bring you free time at arrival airport after a long flight, we provide the Vietnam visa fast track service (fast immigration support service) that will help you to get a visa stamp quickly without waiting for your turn in long queue at the immigration checkpoint. Let’s leave your burden of immigration process to us and enjoy your first moment in Vietnam. Visa arrival works for air travel only, it means there is NO visa on arrival for overland/ border crossing or sea/water entry accepted. Therefore, if you DO NOT enter Vietnam by air, we highly recommend you to apply for visa at Vietnam Embassy or Consulates where you are living or staying in advance. No visa on arrival granted at the airport directly without approval letter issued by the Vietnam Immigration Department in advance. The legitimate visa approval letter should be arranged by an authorized visa agency several days, 1 month, or even 6 months before the departure. For urgent entry, the visa approval letter can be arranged in 1 or 2 hours with rush visa service. You should check the entered information carefully to make sure that they totally match the information on the passport. Also please double check the information from the visa agency’s confirmation (via email) to avoid any spelling or typo mistakes that you entered unintentionally. Normally, that may not be a big problem, however, in some cases your boarding will be refused by the airlines as the information on your visa approval letter does not match those in your passport. So, make sure you submit everything correctly and carefully. Before leaving the immigration counter, you should check the visa stamp and visa sticker to make sure that the immigration officers at arrival airport put the right visa type, date of expiry and other information onto your passport. If there is any mistakes, please ask them to correct it immediately. Vietnam Immigration Department office is closed at the weekend (Saturday and Sunday) and the public holiday. However, the immigration counter at arrival airport opens 24 hours everyday. You don’t worry if your flight arrives at night time on the weekend or holiday as there are immigration officers who always welcome and ready for help.